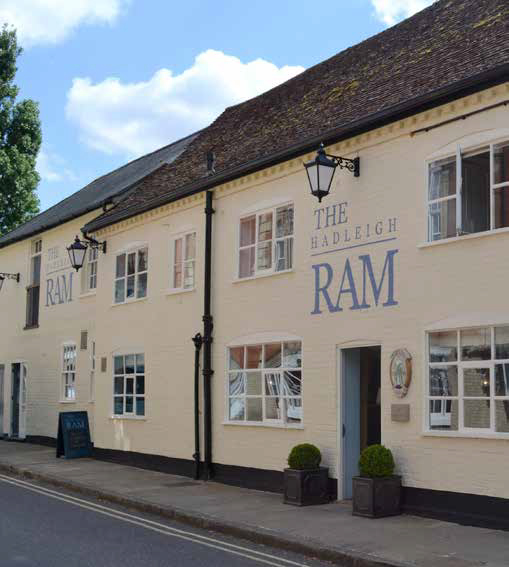 We first visited the Hadleigh Ram last September and had an excellent evening so the prospect of a return visit - this time for lunch - was one I was looking forward to. 2013 saw a change of ownership for the Ram and a major refurbishment by the family run group Stuart Inns who also run the Long Melford Swan. The result was, based on our last visit, the creation of a relaxed yet stylish bistro with an innovative and flavoursome menu backed with great service. So had would the team fare this time? Lunchtime services often have a very different feel to evening meals. The ambience that can be created when the lights go down, and diners are relaxing at the end of a day, is quite different to the energy that is created when daylight is the constant and others around you may be talking business or under time pressure. Add to this that we were visiting on a dull grey drizzle laden Monday lunch time, not necessarily the busiest point in any restaurants booking diary, and we knew we were most probably visiting at a time when we could potentially see the venue at its barest. As we arrived we were enthusiastically greeted by a member of the front of house team and shown to our table. We certainly were not alone. A group of ladies were lunching, a mother and daughter surrounded by the prizes of a morning’s serious shopping were refuelling before the next assault, and a lady encircled by magazines, swatches, pencils and paper was obviously in the middle of some master plan for the beautification of someone’s home. Throughout our meal new parties drifted in and out families, sole diners, friends grabbing a snack and a beer at the bar. Certainly not quiet and certainly not low energy. As we settled at our table I noted the décor, that had seemed warm and cosy in our previous visit, appeared fresh and clean in the daylight. I particularly like the glass entrance. Although perhaps a strange thing to highlight I also noted how comfortable my chair was a reminder that the refurbishment has been conducted with both style and substance in mind. So to the menu. The Hadleigh Ram offers three main menus. 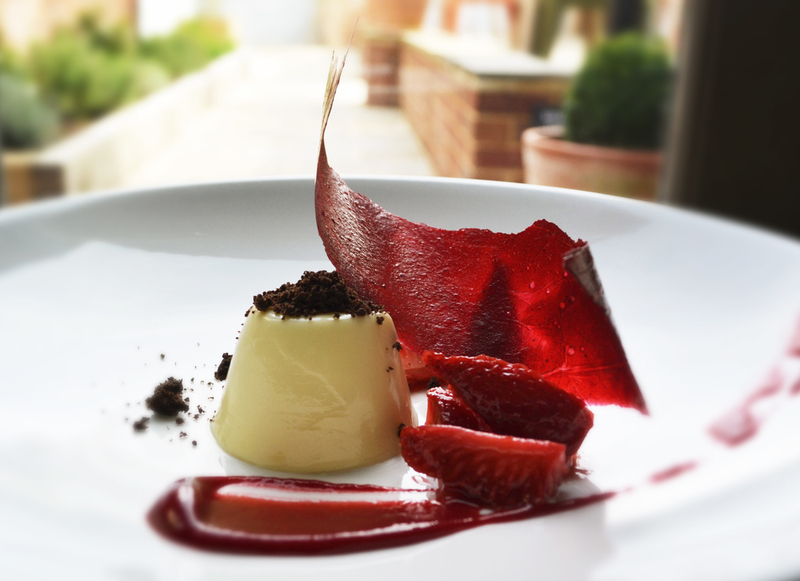 The lunch/dinner menu, the ‘Get Set’ Menu – a fixed offer of two courses for £15.95 or three for £17.95, and a Sunday lunch menu. The ‘Get Set’ menu was very tempting with two options for each course. The asparagus, toasted brioche and pink grapefruit dressing starter caught my eye, as did the piri piri pousin. With a spot of restaurant voyeurism I became aware that this was exactly the choice of a lady on a neighbouring table and she seemed delighted. The main menu offers both ‘nibbles’ and a selection of starters to begin your meal. The nibbles - four choices offered at just £3.05 per dish - are a lighter alternative to a full starter and a great idea, especially for lunchtime dining. It was one of these ‘nibbles’ that drew me away from the set menu and into the full main. I have a penchant for black pudding, not one shared by my wife, so when the opportunity to indulge arises it is a fairly safe bet in which direction I will head. I recall that on my last visit I was drawn to my main dish by its inclusion of hollowed fondant potatoes filled with a black pudding crumble which were gorgeous. This time the temptress was Stornaway black pudding and ham hock croquettes. My good lady opted for the starter sized Shetland mussels which were offered in two styles Thai- or Saffron Sofrito, a mixture of tomatoes, red peppers, eschalots and red chilli – she chose the latter. My starter arrived on a slate and I am still undecided on the whole slate and board option versus a plate however what was noted that the slates used for this, and as it happens my main course, had been warmed. Again good attention to detail – it doesn’t in my experience always happen. With starters gratefully consumed we eagerly awaited our mains. I had chosen, it was lunch after all, the Muntjac burger with Welsh rarebit, onion seeded bun, red cabbage, khol rabbi & mooli radish, coleslaw and chunky chips. I had spied one arriving at a nearby table as we ordered and it looked almost architectural in its execution and very impressive. My wife chose herb crusted roast cannon of hogget (a juvenile sheep older than one year in case you were unsure – I was), verde cannelloni of neck, roasted Jerusalem artichokes, pea purée, peas & tomato liaison, rosemary & olive split jus. 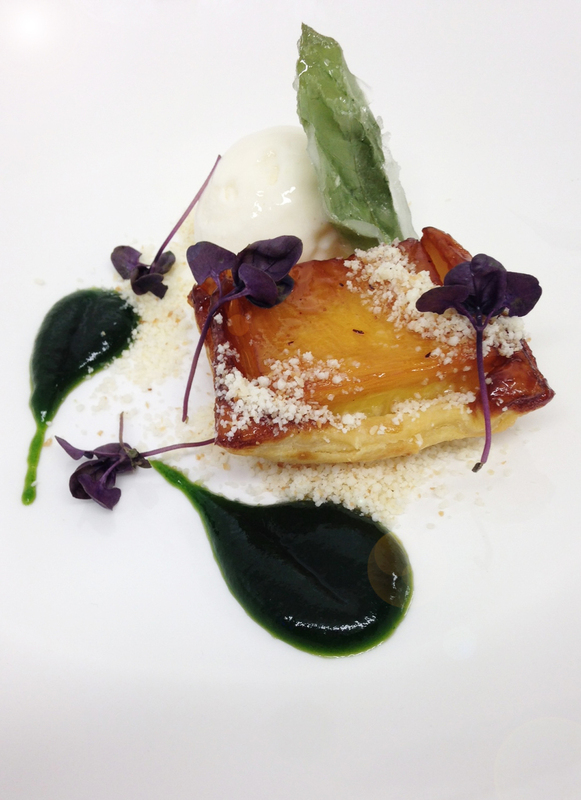 When we review meals we will, in most cases, give the other a taste of our chosen dish. A second opinion is often good and in some cases we may both, if we weren’t reviewing, have chosen the same thing so it’s good to know, in the nicest possible sense, what you’re missing. The fact that on this occasion I didn’t even get a sniff of Mrs R’s lunch was testament to how delicious she found it. “Was there a noticeable difference between lamb and hogget?” I asked “ Yes, definitely, beautiful. Sorry didn’t I offer you any?” was her reply. Enough said. The accompanying thyme roasted cauliflower with garlic butter was also a revelation and a recipe I will be stealing. I always feel that choosing a burger is somehow a culinary cop out. When faced with so many ‘proper’ dishes why would you opt for a meal that has been tagged ‘the meal of convenience’. I doubt very much when the government has looked at the health of the nation that seared stone bass, or mead infused dingley dell pork has ever worried an official, I do however always we feel that somewhere ‘burger and chips’ is on a list and that in the shadows each one consumed is being secretly noted. Well no more shall I feel ashamed because this burger was exquisite. It’s never going to be classed as health food with its creamy welsh rarebit topping but the khol rabbi, mooli radish and coleslaw felt almost virtuous. All flavours working perfectly together. The Muntjac burger itself was sweet, gently spiced and perfectly cooked. Definitely one I will be having again. I have only one complaint from this meal and that was that our waitress accepted “no thanks” as an answer from me when it came to desserts - something I was soon to regret as my wife’s choice arrived. She had gone for the raspberry and chocolate textures of chocolate with white chocolate panna cotta, dark chocolate ganache, liquid milk chocolate, iced raspberry, raspberry leather and raspberry fluid gel. It looked beautiful, and as I was soon to discover – no standing on ceremony waiting to be asked this time – tasted divine. In summary this visit had been equally as enjoyable as our first. Day or night the Hadleigh Ram is a lovely setting confident in its offering and well worth a trip.